Flowering house plants brighten a home and bring a little of nature indoors. While there are a great variety of house plants from which to choose, those with smaller spaces may prefer smaller plants. Some small house plants are seasonal and may only offer flowers for a short period of time. By choosing the varieties that will bloom multiple times your house plants can add a splash of color to your home for most, if not all, of the year. African violets (Saintpaulia ionantha) are a popular potted plant that reaches 4 to 7 inches in height. They sport purple flowers and will continue to flower, year round, provided they are grown in the right conditions. African violets grow best in an area with light, but not direct sun, that is free of cold drafts. They prefer high humidity and moist, but never soggy, soil as they are prone to contracting root and crown rot if they are over-watered. When you water the African violet, North Carolina State University recommends that you use warm water and pour the water directly onto the soil, not the leaves, to avoid creating brown spots on the foliage. 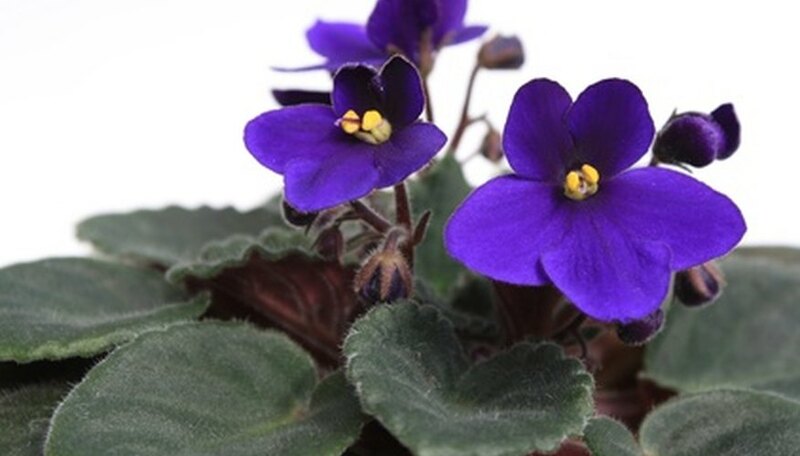 In the winter, to aid in continual blooming, African violets benefit from exposure to grow lights and a minimal room temperature of 60 F, according to Cornell University Cooperative Extension. Geraniums (Pelargonium x hortorum) are among the most popular flowering house plants. They prefer to grow in full sun with room temperatures of 65 to 70 degrees Fahrenheit during the day and 55 F at night. Some geraniums, such as the Martha Washington variety, are not heat tolerant; the North Carolina Cooperative Extension recommends growing these types of geraniums indoors. Scented-Leaved geraniums have leaves that carry various scents. Pelargonium graveolens is rose-scented, P. crispum is lemon-scented and P. odoratissimum has apple-scented leaves. Prune the geranium to keep it at a height of 3 to 5 inches. Deadhead faded blooms immediately to encourage the plant to rebloom. Fertilize geraniums with a common house plant fertilizer once a month in the spring and summer, cutting back to once every other month in the fall and winter months. This house plant is from the Rhododendron genus. It prefers to grow in direct sunlight until it blooms, at which time it needs only indirect lighting to thrive. Keeping the azalea in a night-time temperature of 55 to 60 F will extend its blooming time. Water azaleas just enough to keep the soil moist; do not water azalea with softened water since it is not saline tolerant. There are currently more than 10,000 different varieties of azaleas registered due to 100 years of being hybridized. When you purchase azaleas for house plants, choose the evergreen variety from Japan which does not lose its leaves in the fall and winter months. While some azalea varieties grow quite tall, look for the type that only grow 1 to 3 feet for your home.